The first two weeks of August are hard. Midsummer tends to be the time when our bodies tire of the relentless performing or selling or cleaning or cooking or serving, and our minds are tired from learning, rehearsing, repeating information, etc., etc. The Augusts hit our historic town just as Barkerville and Wells are being happily invaded by the annual phenomenon called ArtsWells, a massive art, theatre, and music festival that takes over our lives for four glorious days and nights. If you’re anything like me, you spend way more of your free from-work-time than you probably (or, at least, responsibly) should dancing, venue hopping, singing and generally whooping it up. This makes the mental and physical midsummer fatigue even more acute. In early August my corset seems to pinch just a little more, the dust in my teeth seems grittier and the distance from the Visitors’ Reception Centre all the way to Chinatown feels twice as long as it used to. I am happy to report, however, that the hard part of the Augusts only last a couple of weeks and then a new August feeling settles in – the realization that our first wave of goodbyes is looming. Many of our summer workers do not stay for the September season, which means we are close to the time when we must choke down our sadness and ready ourselves for a parting-of-the-ways from great friends with whom we have just had a remarkable common experience. The final two weeks of August are when we savour the dying days of our time as a full company of heritage warriors. Very soon, for example, a close friend and fellow interpreter will have to say goodbye to her Wells sweetheart, who will leave us for his second year of a Masters program at a University far too far away. I myself will soon bid farewell (for now) to two dear actor friends who make Vancouver home in winter, but who have just had their first taste of our summertime Cariboo community, which truly is a community (just yesterday, for example, someone quietly, without their knowledge, fixed a flat on their car while they were working so that the car was ready to drive home by the end of their shift – how wonderfully Cariboo is that?!?). Midsummer is when Chinatown blossoms into radiant splendour in the form of the (necessarily early) Mid-Autumn Moon Festival, and we have the beautiful experience of meandering through Barkerville at dusk, lit only by the glow of a hundred or so lanterns in the evening parade. August is also when we realize there is not much time left to do all the things we have been meaning to get to (for me – a climb up the stairs at the new Canadian Claim exhibit to gaze upon our site from way up on the eastern mountain slope, a quiet walk along the “Barkerview Trail” that hugs the western hillside, or an annual pilgrimage to the historic cemeteries). August is the time when we dream ahead to when we will get more than one or two days off at a time, but dread the inevitable loneliness that always follows the summer season. It is sad to put Barkerville away for another year, and this is the month when we can feel that the end is coming. In August there are potlucks, and evening cabarets, and lingering conversation around a campfire, and spontaneous jumps in local lakes that take on a sweet, sacred quality… almost as if they are already half-memories while we are still living in the moments. August is full of fatigue, to be sure, but it is also filled with gratitude for the season we are having, and the ongoing privilege of working and living in this very special place. 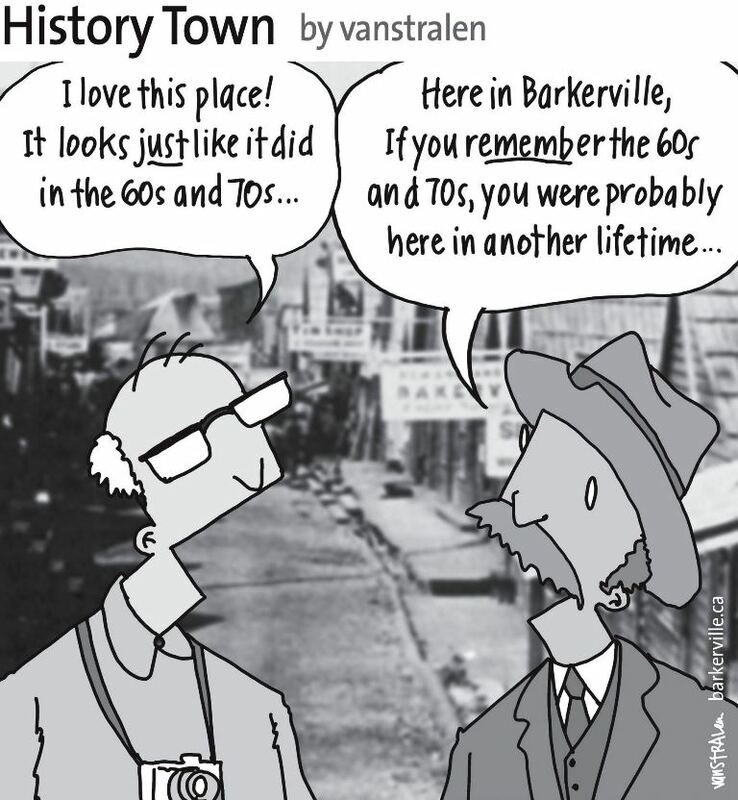 The above one-panel cartoon (originally published August 9, 2014) by Dirk Van Stralen, with accompanying editorial by Danette Boucher, is the thirteenth of twenty weekly entries that were logged – and subsequently blogged – as part of a 2014 collaboration between Barkerville, British Columbia and the Prince George Citizen aimed at introducing some of the quirkier advantages to living, working, and playing in the Cariboo Goldfields. We hope you enjoy!